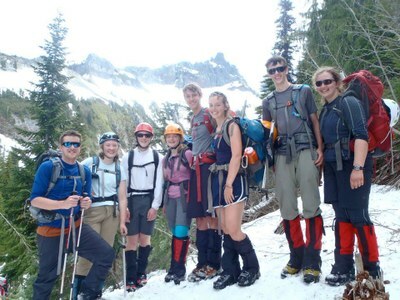 The Adventure Club is a year-round outdoor adventure program for youth of ages 14-20. The Mountaineers is proud to host an Adventure Club in Seattle and Tacoma. The Adventure Club is a year-round outdoor adventure program for youth of ages 14-20. The youth members plan all of their outings, with guidance from adult advisers. From single-day outings to week long camping trips, activities have included rock climbing, whitewater rafting, hiking, car camping, snow-cave camping, cross-country skiing and mountaineering. While attendance at all meetings is not required, it is critical that participants attend as many meetings as possible, and participate in at least half of the trips. From single-day outings to week long camping trips, activities have included rock climbing, whitewater rafting, hiking, car camping, snow-cave camping, cross-country skiing and mountaineering. In order to ensure a quality program, participants are required to attend 80% of the general meetings, one trip or activity per month for at least 7 months, and co-lead at least one trip. Parents/Guardians are expected to support the club on at least two trips. Support could include driving, serving as a volunteer leader, or managing the kitchen with youth cooks. Registration cost is $285 as listed above, then you will be charged $110 each month starting in November through August. We will have a second registration window opening in February if space is available.